Russian physician and scholar; born about 1850; died in 1885 at Kishinev, where he had settled a few years previously. 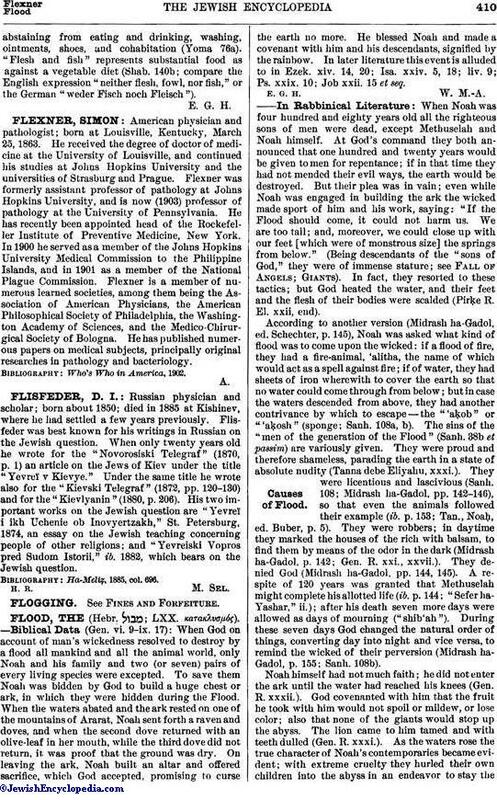 Flisfeder was best known for his writings in Russian on the Jewish question. When only twenty years old he wrote for the "Novorosiski Telegraf " (1870, p. 1) an article on the Jews of Kiev under the title "Yevreï v Kievye." Under the same title he wrote also for the "Kievski Telegraf" (1872, pp. 120-130) and for the "Kievlyanin" (1880, p. 206). His two important works on the Jewish question are "Yevreï i ikh Uchenie ob Inovyertzakh," St. Petersburg, 1874, an essay on the Jewish teaching concerning people of other religious; and "Yevreiski Vopros pred Sudom. Istorii," ib. 1882, which bears on the Jewish question.